159 Beacon is located on the south side of Beacon, between Berkeley and Clarendon, with 157 Beacon to the east and 161 Beacon to the west. 159 Beacon was built ca. 1861, one of six contiguous houses (149-151-153-155-157-159 Beacon) built at the same time in a symmetrical pattern. The two houses on each end (149-151 Beacon and 157-159 Beacon) feature arched, extended entries and dormers with peaked roofs, and the two houses in the center (153-155 Beacon) have entries flush with the façade and originally had dormers with arched roofs (the dormer on 153 Beacon was remodeled sometime after 1942 to have a peaked roof matching the dormer on 151 Beacon). 149-159 Beacon were built on a parcel of land with a frontage of 125 feet purchased from the Commonwealth of Massachusetts on September 2, 1858, by George Goss and Norman Carmine Munson, the contractors responsible for filling the Commonwealth’s Back Bay lands. On the same day, the parcel was purchased from them by Peleg Whitman Chandler, Jonathan Amory Davis, and Henry Lee, Jr.
On July 5, 1860, Messrs. Chandler, Davis, and Lee subdivided the property into six lots. Peleg Chandler bought 149 Beacon, and Henry Lee and J. Amory Davis bought 157 Beacon; the other four lots were bought by individual buyers. Construction of the houses began soon thereafter. Click here for an index to the deeds for 159 Beacon. In his Houses of Boston’s Back Bay, Bainbridge Bunting indicates that all six houses were built by “Bourne & Leavitt.” Robert Tower Bourn (Bourne) and William Leavitt were house carpenters. They bought the lot at 159 Beacon on July 5, 1860, and sold it with the completed house the next year. It appears likely that they built the house and, as indicated by Bunting, also built the other houses at 149-157 Beacon. 159 Beacon was purchased from Robert Bourn and William Leavitt on August 10, 1861, by Frederick Augustus Whitwell. He and his wife, Mary Crowninshield (Silsbee) Whitwell, made it their home. They had married in June of 1861 and 159 Beacon probably was their first home together. He previously had lived at 79 Beacon with his parents, Samuel and Sophia (Story) Whitwell, and his unmarried siblings: Henry, Sophia Louisa, and Samuel Horatio Whitwell. By 1865, they all had moved to 161 Beacon, next door to Frederick and Mary Whitwell. Frederick Whitwell was an importer of woolens and later a real estate broker and investor in partnership with his brothers, Henry and S. Horatio Whitwell. Frederick and Mary Whitwell continued to live at 159 Beacon until about 1868, when they moved to a new house they had built at 239 Beacon. On May 7, 1868, 159 Beacon was purchased from Frederick Whitwell by Mrs. Mary Ann (Binney) Hayward, the widow of Dr. George Hayward. Dr. Hayward was a surgeon and, in 1846, had been the first physician to use ether in a surgical operation. Prior to his death in 1863, they had lived at 16 Pemberton Square. 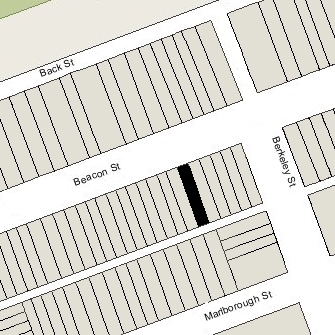 Before moving to 159 Beacon, she may have lived briefly at 21 Marlborough. Living with Mrs. Hayward were Martha Mansfield (Shepard) Silsbee, the widow of Salem merchant John Boardman Silsbee, and their children: Emily Fairfax Silsbee, Arthur Boardman Silsbee, Martha Silsbee, and Thomas Silsbee. They also maintained a home in Beverly. In June of 1871, Emily Silsbee married to dry goods and textile merchant Amory Appleton Lawrence. After their marriage, they lived in the Longwood district of Brookline and at 77 Beacon, and then at 59 Commonwealth. By 1872, Mrs. Silsbee had moved to 256 Beacon. 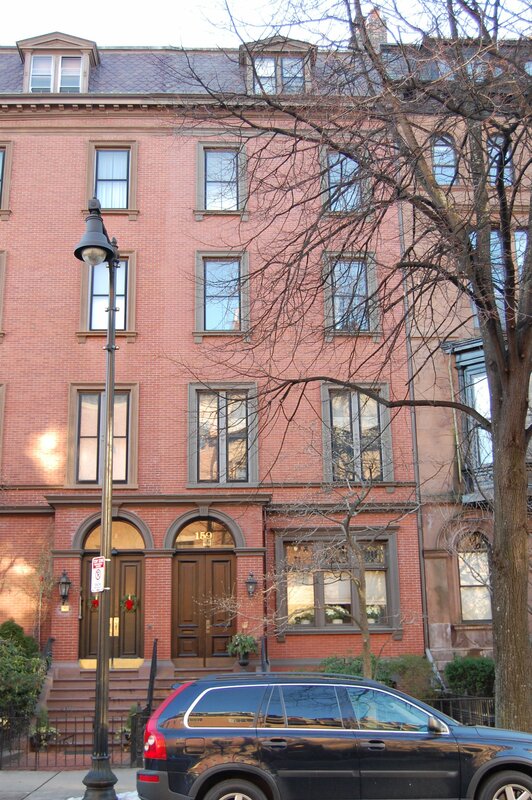 Mrs. Hayward continued to live at 159 Beacon until 1877, but had moved to 1949 Washington by 1878. She continued to own 159 Beacon and lease it to others. During the 1877-1878 winter season, 159 Beacon was the Boston home of Emily (Dunbar) Wooldredge, the wife of John Wooldredge. In 1877, she and her husband had lived at 224 Beacon. They maintained their primary residence in Lynn, where he was a shoe manufacturer. He also was president of the Eastern Railroad and First National Bank of Lynn. During the 1878-1879 winter season, it was the home of Rev. Leighton Parks, Rector of Emmanuel Church, and his wife, Margarita Alden (Haven) Parks. They had married in August of 1878 and 159 Beacon probably was their first home together. By the next season they had moved to 293 Marlborough. 159 Beacon was not listed in the 1879-1880 Blue Book. In 1880, 159 Beacon was the home of Anna Huntington (Lyman) Mason, the widow of Rev. Charles Mason. She previously had lived at 231 Beacon. She had moved by the end of the year, and by the 1881-1882 season was living at 202 Beacon. 159 Beacon was not listed in the 1881-1883 Blue Books. On April 5, 1883, 159 Beacon was acquired from Mary Hayward by Francis Cabot Lowell, an attorney and future federal judge. He and his wife, Cornelia Prime (Baylies) Lowell, made it their home. They previously had lived at 80 Marlborough. Francis Lowell died in March of 1911, and Cornelia Lowell continued to live at 159 Beacon until her death in January of 1922. On March 28, 1922, 159 Beacon was purchased from the estate of Cornelia Lowell by Susan Edith (Waterbury) Weld, the widow of Stephen Minot Weld, Jr. He had served in the Civil War from 1861 to 1865, rising to the rank of Colonel and, upon discharge, was brevetted a brigadier general. After the war, he became a cotton and wool broker, and served as treasurer of the Elliott Felting Mills. Susan Edith Weld previously had lived in Dedham, where her husband had died in March of 1920. She also maintained a home in Wareham, which Stephen Weld had purchased in the early 1880s. In about 1947, Susan Weld was joined at 159 Beacon by Mary Frances (Blodgett) Nye, the widow of Theodore Herbert Nye. She previously had lived in Springfield, where her husband, a wholesale provisions dealer, had died in April of 1924. By 1948, Susan Weld and Mary Nye had moved to 121 Marlborough. On February 28, 1948, 159 Beacon was acquired from Susan Weld by John Francis Nangle and his wife, Jane Frances (Potter) Nangle. They previously had lived in Brookline They continued to live at 159 Beacon until his death in April of 1981. After his death, Jane Nangle probably continued to live there, but at the time of her death in April of 1988, she was a resident of Newburyport. On February 26, 1990, 159 Beacon was acquired from Jane Nangle’s estate by Dr. Sidney Levitsky, a cardiothoracic surgeon, and his wife, Dr. Lynne (Lipton) Levitsky, a pediatric endocrinologist. They continued to live there until 2004. The house subsequently changed hands. It remained a single-family dwelling in 2015.